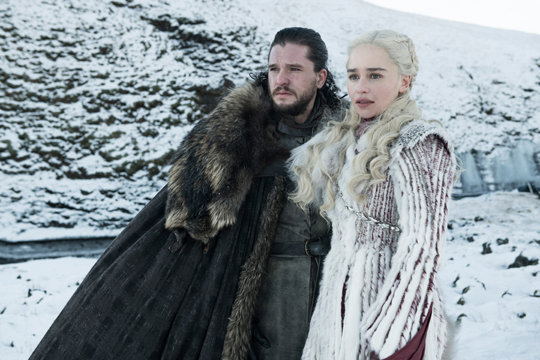 The end is coming, and Game of Thrones fans are on the edge of their seats waiting for the first episode of the eighth and final season of the hit TV series on April 14. As fans prepare to return to Westeros, Spotify unveiled a refresh of its rock-influenced playlist, “Game of Thrones: The End Is Coming” (formerly named “Songs of Ice and Fire”), a collaboration between Game of Thrones co-creators David Benioff and D.B. Weiss, and Spotify. Also available on the music streaming platform are seven house-themed playlists curated by HBO and featuring composer Ramin Djawadi score songs that relate to each family’s journey on Game of Thrones. Check out the playlists on Spotify, which include House Baratheon, House Targaryen, House Stark, House Lannister, The White Walkers, The Night’s Watch, and the Great Houses. In addition to the playlists, Spotify also revealed a couple of GoT fans’ listening habits. According to the music streaming subscription service, more than 250,000 listeners have created their own Game of Thrones-themed playlists as well as character playlists. In fact, with what could be a hint as to whom Spotify listeners think should sit on the Iron Throne, Tyrion Lannister has the most fan-made playlists, with more than 7,700. He’s followed by Hodor, Jon Snow, Cersei Lannister, and Arya Stark. Meanwhile, “Light of the Seven,” the piece playing when Cersei blows up the Sept of Baelor in the hair-raising Season 6 finale, is the most-streamed Djawadi composition since January 1, 2016, followed by the show’s eponymous “Main Title,” and “The Winds Of Winter,” which accompanies Arya as she sails to Braavos at the conclusion of Season 4. Press play because winter is here.